Northmor second grader Ryliee Hobson is pictured with Capt. Kenny Underwood of the Mount Giliead Police Department. Hobson has been making ribbons and donating all proceeds to support the Westerville Police Department. MOUNT GILEAD — Ryliee Hobson has a heart for helping others whenever there is a need. Ryliee, a second-grade student at Northmor Elementary School, is the daughter of Ashley Hammond and Todd Hobson. 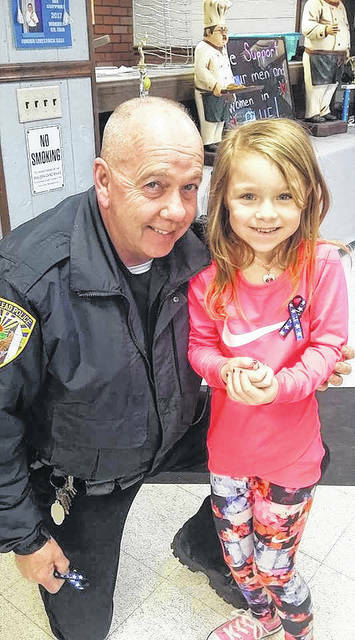 When Ryliee heard about the shooting of Westerville Police Officers Eric Joering and Anthony Morelli on Feb.10, she told her mom that she wanted to help the families left behind by the tragedy. Ashley let Ryliee pick out the ribbon to be used and lets her do as much of the work in making them as she can. On Wednesday, Pizzaburg Pizza held a fundraiser at each of its stores and donated 30 percent of the sales that night to local police departments. Ryliee took her ribbons and raised $200 for the Westerville Police families. Ryliee will be delivering the money to the Westerville Police Department herself in the near future. Her police ribbons also will be available soon at Dear Downey in Galion. Owner Kaela Downey has also been fundraising for Westerville police through the sale of T-shirts at her business. Downey and Hammond are cousins, so coming together to support this cause was an easy decision. https://www.morrowcountysentinel.com/wp-content/uploads/sites/29/2018/02/web1_28055692_10216488497311174_3672558114117818617_n.jpgNorthmor second grader Ryliee Hobson is pictured with Capt. Kenny Underwood of the Mount Giliead Police Department. Hobson has been making ribbons and donating all proceeds to support the Westerville Police Department. Contact Erin Miller at emiller@aimmediamidwest.com or 419-468-1117, extension 2049.